Given the Palo Alto "process", I think it has been wise for Caltrain to stay out of this discussion. It seems likely, given the progress so far and the continued opposition to raising the tracks in any way that the result will be keeping all tracks at grade and dreaming about a tunnel for another decade or so. 1) Make University Ave a 4 track station with short sidings for the outer platforms. Make Caltrain wait at University for HSR to overtake. This is basically the "reduced overtake" plan shown in the business plan, but using University instead of California Ave. University make more sense to me as all Caltrains stop there anyway and it is already wide enough. 2) Extend 3 tracks South to Churchill (removing Stanford platform) and north to Ravenswood (new single track bridge over the creek). 3) As part of the Ravenswood grade separation and Menlo Park station rebuild, extend 3 tracks further north, as well as through Calfornia Ave station to the south. Now the 3 track section includes 3 stations. Churchill is a 3-track at-grade crossing or is closed to traffic. With this 3 track infrastructure and 4 track University Ave station in the middle, southbound overtakes would use the northern middle track for HSR and northbound overtakes would use the southern middle track. In either case Caltrain would hold at University and wait for HSR to pass. With the full buildout in 3), overtaking Local trains would occur over 2 Caltrain stops (either Cal Ave or Menlo Park plus University), so the delays to local Caltrains waiting for the overtake would be reduced or maybe even eliminated, depending on the headways and dwells needed. Does anybody think this would work? If you extend 3 tracks north all the way to Redwood City, this starts to look a lot like the long-middle 3 track overtake that was eliminated from the HSR EIR. Assuming new 3-track at-grade crossings are allowed (which is the basis of the new HSR plan south of Tamien), this seems like a pretty practical (and incremental) way to implement an overtake. I like your way of thinking, but I look at it as Palo Alto can have up to 8 stops per hour (per direction) between California Ave and University stations and must decide whether each station gets 4 stops, whether Cal Ave gets 2 stops and Univ gets for 4 stops, or if they'd like to have 4 tracks and then each station can have 6 stops per hour. I like that way of thinking because PA does want Caltrain to stop there, but they should choose how much service they want vs how many tracks they are willing to have. The long middle 3-track overtake was analyzed in detail by consultant SMA (then working for HSR, now also working on the Caltrain business plan). Their observation was that the key to making it work better was not to think of it as two separate "northern" and "southern" overtakes for each direction, but treat it as a single overtake facility usable along its entire length for both directions. Railway signaling does the rest. Slides from 2016, prepared by a joint HSR/Caltrain scheduling working group, are here. This pre-dates the Caltrain business plan effort, and I believe the JSWG was disbanded after 2016. See pages 41 - 48, especially the runtime results on page 48. If you followed their results to a logical conclusion, it became clear that the long-middle-3-track was improperly eliminated from the HSR EIR process way too soon. I think the cards are being shuffled again, because some of the overtake tracks now being contemplated by Caltrain would be needed regardless of HSR, so the EIR scope and responsibilities may shift once more. I think the assumptions and goals of the SMA study were a little different to the current plan. SMA were using a skip-stop style pattern for Caltrain and trying to keep all SJ-SF times around 60 mins. For the business plan discussions, they seem to be converging on a local/express stopping pattern where the locals take ~80mins SJ-SF and dwell 5+ mins at RWC for express overtake and Cal. Ave. for HSR overtake. My point is that if you are going to wait 5+ mins in Palo Alto, you would be better to do it at University Ave. and an incremental approach to extending 3-track segments north and south can reduce the required waiting time for the locals incrementally. Politically it seems like a 3 track at-grade PAMPA overtake is a lot more realistic than 4 tracks in South Palo Alto. I agree that this was eliminated from the HSR EIR process too soon. However, maybe it is better if it is proposed later by Caltrain as a way to improve Caltrain service that residents of the cities affected will directly benefit from. Using some crude measurements, I see that spacing between platform edge at Lawrence is about 64 feet. However, spacing between two center tracks is about 5 feet wider than between either of the two side pairs, so it feels like trains could safely pass with 60 feet of space. Where do the extra 15 feet of (75 feet required minimum) come from? Normal track center spacing is 15 feet. With a fence (as in a station) it is 18 feet. Platform edges are 5'4" from track center. OCS poles are 10 feet from track center. The poles themselves are a couple of feet wide counting the foundation. So at Lawrence the figure is 5'4" + 15' + 18' + 15' + 5'4" = 58'8"
In south Palo Alto a 4-track corridor would take 2' + 10' + 15' + 15' + 15' + 10' + 2' = 69', plus I threw in 6' of margin to get 75'. If you want wide maintenance access roads on both sides of the corridor, you get to 100' often cited by the HSR people, but those roads aren't strictly necessary as clearly demonstrated by the existing overtake tracks in Sunnyvale and Redwood City where there are none. So that's where my figure of 75' for four tracks comes from. What does the speed of the train have to do with grade separation? The answer: nothing. I think Anonymous is attempting to make a passive-aggressive argument that everything would be better if CHSRA had only played nice with UP and used the existing tracks at a lower speed. The trench goes under a UPRR branch and has to be a trench because south of the branch is an elevated freeway. Through the center of Fresno, at the station, it is at grade. Anon just likes muddy water. @Peter: Correct but only to get to "Downtown"
"Like the planned Californian network, the Korean high speed line made full use of the existing rail network to penetrate urban areas and to serve rebuilt existing stations in Seoul, Daejon and Busan. Existing right-of-way was utilized to deliver benefits earlier and to extend the reach of the network. For the first six years of operation, KTX trains used a pre-existing low speed track segment to reach Busan. The southwestern cities of Gwangju and Mokpo are still served by existing lines, pending new line construction." 1) When the Channel Tunnel opened in 1994, the Eurostars had to use diesels for one year (until they were modified to operate off the 750V DC third rail). In 2003 they were able to operate under 25KV @187 MPH up to Northfleet when CTRL (HS1) section 1 was completed. They eventually switched from Waterloo to St Pancras in 2007 when HS1 section 2 was opened (25KV all the way). 2) The "UPRR branch" goes nearly all the way to West Panoche Road (the connection to Panoche Pass). Muddy Waters- Can you please give a reference for #1? I am not bright enough to find it on the internet. The fact that SR-180 is elevated is not why the trench had to be built. The trench was needed because UP has refused to play along with HSR at all, especially when it comes to its mainline through the Central Valley, armchair engineering notwithstanding. Just look at the pergola structure. That was only necessary because UP refused to let the HSR crossover even TOUCH its ROW. It's not HSR that has been intransigent, it's UP. Otherwise, HSR could have just built an ordinary viaduct to cross the ROW, much less share tracks, ROW, or even build tracks adjacent and PARALLEL to the UP ROW. So, Anonymous, if we scoff at your suggestion of sharing UP tracks or ROW for any purpose, that is why. Disclaimer: Given the talk about HSR sharing tracks between Gilroy and San Jose with Caltrain, I am unsure whether that is something that UP is actually open to due to only a low volume of freight traffic (it's their tracks, after all), or whether it's just a cost-cutting pipe dream. Pretty sure the pergola is due to the acute angle at which HSR crosses UPRR. You couldn't do that with an ordinary viaduct. Yeah, but the width of the pergola is because it completely straddles the UP ROW. A few straddle bents would have sufficed if they didn't have to completely avoid the UP ROW. Another reason why UPRR will not let HSR anywhere near its tracks is because they know what will happen to their track circuits the day Caltrain flick the switch between CP Coast and CP Lick. Yeah, that says nothing about diesels operating the Eurostars for Channel Tunnel service. The overnight trains never happened. Muddy Waters is incorrect, or just poorly informed about UK rail. Eurostar never operated in commercial service behind diesels, and the trains were never "modified" to operate on 750V third rail. They were built that way from the start. The service did suffer teething problems due to interference with the signal system, a topic I wrote about over 20 years ago before blogs were a thing. Could it be that Muddy Waters got confused with the TGV operation behind a CC72000 between Nantes and Sables-d'Olonne between 2000 and 2004? There were, however, cases when Eurostar train sets were hauled with diesel locomotives; I recently stumbled over a picture where a pair of Class 37 were used to get the train from the North Pole to Victoria when the regular connection was not available. There were Eurostar non-revenue moves with diesel, yes. The trains WERE revenue service during the so-called "limited Discovery service" right after this fiasco: https://en.wikipedia.org/wiki/Eurostar#Minor_incidents. The diesel locos pushed the train from Waterloo all the way to the entrance of the tunnel and stopped. The Eurostar then raised its pantos (the 25KV came from France and terminated +/- 2,000 feet on the British side of the tunnel) and when all was well and good (after EXTENSIVE light flickering), the locos were decoupled and the train departed 5 minutes later (the entire thing took 10-15 minutes each way). There was very little traffic in the tunnel at the time, so it was EXTREMELY cold (I had a sweater and a trench coat on and I was freezing). There was a strong musty smell at the bottom of the tunnel and the crossing took +/- 35 minutes (max speed 70 MPH). This went on for over 6 months until they got all the bugs out that Clem mentions in his article. I believe that the only trains operating off the 3rd rail during the "limited Discovery service" were NON-REVENUE. "Two of the stranded Eurostar trains were pushed to London St Pancras by diesel locomotives"
Ok, so now I'm confused. What is your point about Eurostar being pulled by diesel, and what does it have to do with HSR? https://caltrain-hsr.blogspot.com/2019/01/palo-alto-designing-in-vacuum.html?showComment=1549078530066#c7917893626394199276 is a roadmap for how Caltrain/HSR will evolve between San Francisco and Gilroy over the next 10-20 years (think of Gilroy as Ashford). As an example, there is a fairly good chance that the Stadler EMUs will get pushed by F40s up and down the Peninsula for at least 6-12 months before they are let loose under their own power. Why would they pull EMUs with diesels on the peninsula, instead of just pulling regular trains with diesels if the catenary system isn't ready? By "regular trains" I meant the current rolling stock. Looks like they are converging on "at-grade" or elevated options, which is more down to earth than originally proposed aerial structures. For the life of me, I don't see what benefit can be gained by going with the elevated portion given that all the streets nearby are already grade separated. There's the issue - that's not even mentioned in any of the slides - 2 tracks have short platforms, but even those can fit the upcoming EMU-7 Caltrain sets or current ACE 6-car trains. Interesting note. With Caltrans ordering single-level Siemen's cars (like Brightline), there's opportunity to have high-level boarding when sharing Caltrain platforms - whenever Caltrain gets to that. Since HSR is likely to choose the elevated 280/87 alignment to Tamien despite Clem's objections, an elevated platform for HSR is probably required and this option is certainly better then the 50 foot high platforms with concourse level over existing platforms previously proposed. Personally, I think if HSR had an elevated alignment bypassing CEMOF curve leading to a 4-track ~20ft elevated platform replacing the existing eastern 4 tracks at Diridon but shifted north that would not be too bad. An open ground level concourse next to BART with HSR/Caltrain above and Amtrak/ACE platform along the western edge would be pretty nice. This plan would allow Caltrain to continue using the 4 western tracks and UP/Amtrak/ACE to switch to using the middle track during construction. Once Caltrain switches to using high doors, they could use the new elevated HSR platforms too. Then maybe the western platforms could be raised eventually, though I don't know who would pay for that. Yeah, no one is enforcing it. Besides, even though the corridor is rated for 79mph, does Caltrain _ever_ get over 60mph? Would this possibly have been part of the PTC extension? @J. Wong: all Caltrain runs regularly far exceed 60 mph! While expresses and "bullets" do so more than locals, they normally all hit or approach ~79 mph during some part of their runs. What does this mean realistically for Caltrain and intercity rail? It seems like he wants to finish completion of the stub within the Central Valley. Now how's the HSR-compatible we'll-get-on-it-by-2060-for-sure 1880's-style Pennsylvania Railroad-compatible high platform "level boarding" thing working for you all? How's that HSR-compatible we'll-get-on-it-by-2040-for-sure batshit-insane-limited-stops-always this-time-for-sure-we-have-a-business-plan "service" pattern "planning" thing going? In wonderful news: the same assholes who totally fucked up HSR, Transbay, Caltrian electrification, Caltrain signalling and all the BART extensions are going to be looking for a source of billions of dollars or sweet sweet sweet pork funding where failure is not only tolderated, not just expected but demanded, and demanded for decade after decade. Caltrain's looking even better than ever! Is it really what he announced?? Funny thing, he didn't shut down the CA HSR Authority. Also, the Central Valley part will be completed, which means tracks & signaling & maybe electrification? Plus if the funds are forthcoming from either the Feds or private ventures, then look for more. I don't see how Governor Newsom's plan diverge from 2018 CHSR Business Plan. All it does is put more immediate emphasis on Altamont over Pacheco. Bye-bye stupid trains with lots of doors at random heights and no seats? No, stupid, too-narrow, far-too-few-seats, far-too-much-electrical-equipment-in-what-should-have-been-seating-space trains forever. 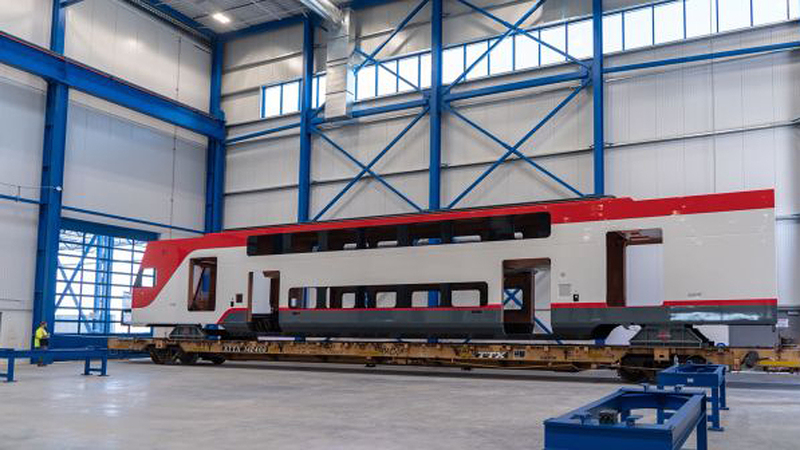 Hey, Stadler -- a first-class rolling stock manufacturer -- just built exactly what contemptible incompetents with billions of Other Peoples' Money to burn tell them too. We can't have nice things because it's not in PTG's or HNTB's or PBQD's or Aecom's or ... interests for us to do anything but fund repeated failure. Ding dong!!! HSR on the peninsula is dead. Now that it's kaput, perhaps this blog should be renamed "Caltrain Compatibility Blog". Now that it's kaput, maybe NOW we can have level boarding with all doors at the same height. God bless our new Governor. He's gonna take a bunch of crap from those with their hands deep in the pockets of the taxpayers, but this new brand of leadership is very welcome. It's my understanding that he needs to deliver a project or return the money to the feds. Hence, bakersfield to Merced, which won't even cover the power bill from fares. Might be worth considering doing 125 over those tracks for amtrak though. Caltrain wins. They get electrification and don't have to share. It's all a political move. Keep building what's already under construction. Put it into use early - as already was talked about, but maybe not formalized. "Stop" work that was unfunded and hasn't started yet. If you had doubts, note all the corrections today that HSR isn't being killed. The takeaways: Palmdale and Pacheco bad, Central Valley good. I still think the Palmdale argument is a wash. A closer tie to Las Vegas and an added 500,000+ population service area (Lancaster-Palmdale-Victorville) are a good get considering how far LA is from the valley and Northern California. LA to SF is not an optimal distance for HSR no matter how you dice it.